Calling all daredevils! 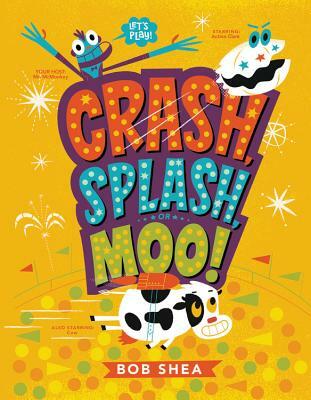 It's time to play CRASH, SPLASH, OR MOO! in this boisterous picture book with all the excitement of a game show. Readers will be laughing, cheering, and giving themselves a round of applause as they play the game over and over again. Bob Shea, creator of many favorite funny books, including Unicorn Thinks He's Pretty Great and the Ballet Cat series, provides endless storytime fun with high-energy audience participation. Bob Shea has created many books for young people, including the popular Dinosaur vs. series, Unicorn Thinks He's Pretty Great, The Happiest Book Ever and The Scariest Book Ever, and the early readers featuring Ballet Cat. He has also invented stories such as Big Plans, illustrated by Lane Smith, and drawn the pictures for books such as Love, Triangle, written by Marcie Colleen. Bob used to make things for Comedy Central and PBS Kids. Now he makes things for no reason--like animations, a giant lemon head, and his basement game show, Jackpot Basement. He invites you to visit him at bobshea.com, and to give yourself a round of applause.